There are sections of light patterns and dark patterns on this warp because i couldn't decide which i liked better. So I call it Finding My Way. In the end I am happy with the balance between the light and dark on the front and the back is mostly dark. The most unusual part of this design is in the shoulder seam. My fabric was about 14" wide. When I put two strips together I realized the proportions were off so I lifted the top strip up to see how narrow I wanted it to be and when i did I realized that there was going to be a lot of wasted fabric that would normally be cut off. By making my shoulder seam on the outside of the garment I could let the 5 or so inches of extra fabric fall to the front and back of the shoulder seam. I like the effect, especially on the back. The only downside is that it makes double fabric heaviness across the shoulders. In cool weather that is fine but it gets warm in the heat of the day. With the leftover fabric I made a matching purse which is lined with muslin. One side of the purse is the dark pattern and the other side is the light. I love that I get to enjoy both aspects of this warp because I never did decide which I liked best. Everybody loves the fringe feature on the front. I feel like a choir girl in this top. 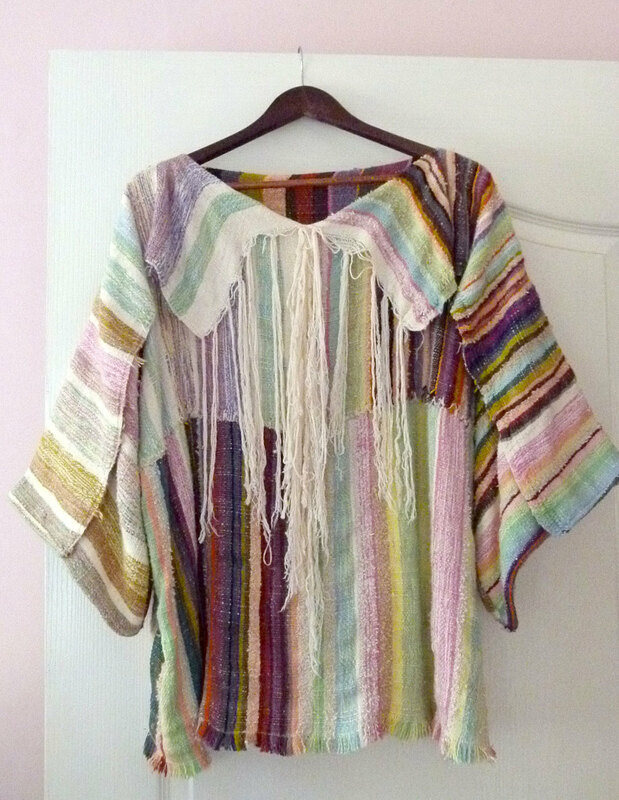 It must remind me of a choir robe in my past. You can see the hand stitching I did to connect the top and bottom strips. The deep shoulder seam makes a cute awning across the shoulders. Here is a sleeve closeup showing the inside out shoulder seam. Here is the light side of the purse. And the dark side. 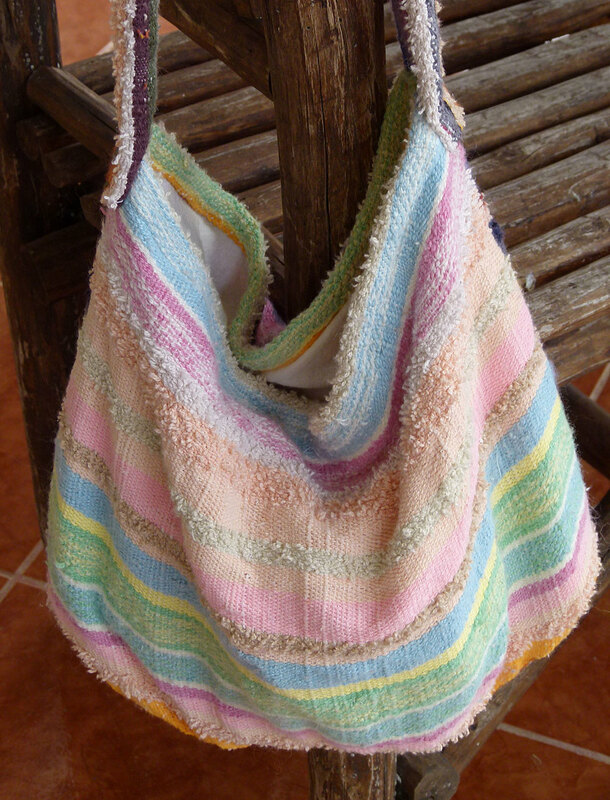 The handle and body of the purse are lined with muslin to make it sturdy for everyday use.